I guess you all knew it was coming, sooner or later - right ? Rather than clutter up the already busy 'eBay' 7Axx forum section, I thought I'd start a separate thread here, and link across to it. I can always move it. 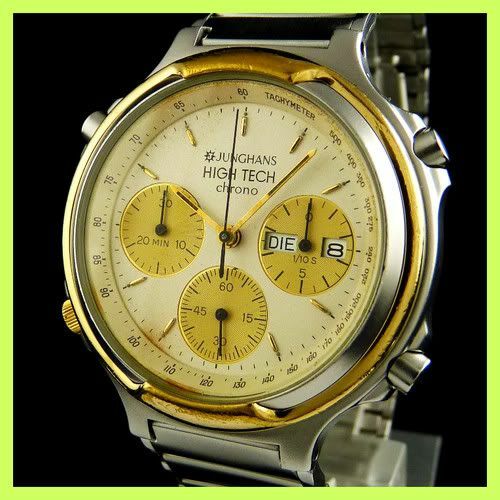 JUNGHANS HIGH TECH HERREN CHRONOGRAPH BICOLOR EDELSTAHL UHR + DAY&DATE + TACHYM. 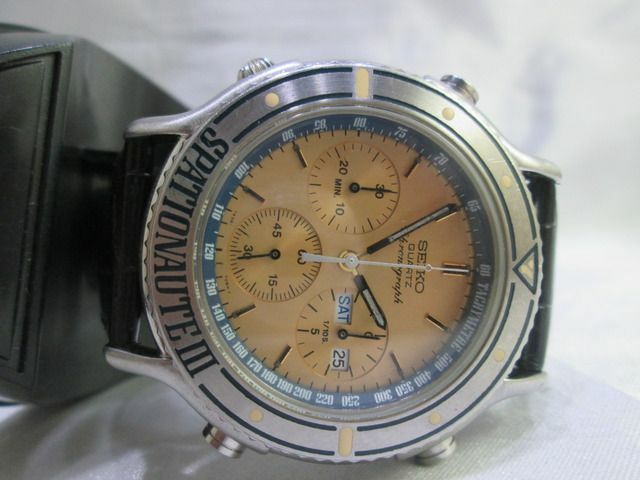 Sie bieten hier auf einen sehr schönen HIGH TECH Herrenchronographen aus dem Hause "JUNGHANS". Das Model verfügt über ein satiniertes Edelstahlgehäuse mit einem goldglänzenden Lünettenring, einem kratzfesten Mineralglas, sowie jeweils einem Flankenschutz für Krone und Drücker. Auf dem klassisch gestalteten Ziffernblatt wirken die filigranen Zeiger und die aufgesetzten Indexe besonders ansehnlich. 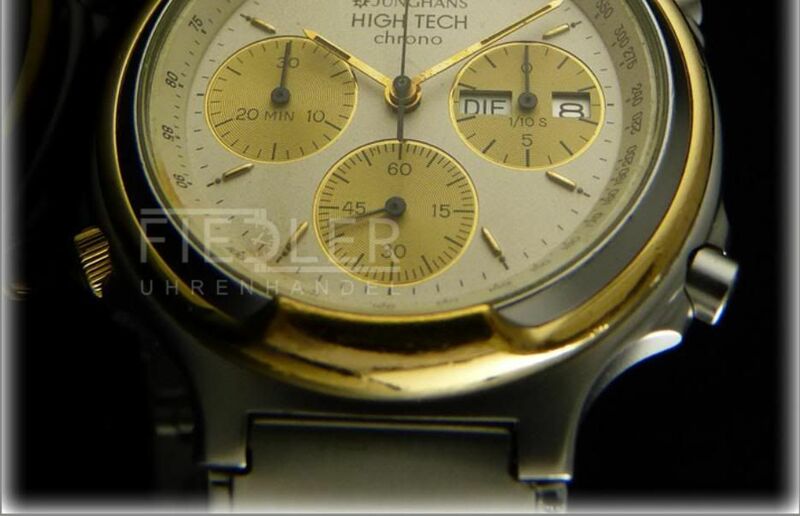 Auch die gold unterlegten Chronographenaugen kommen gut zur Geltung. 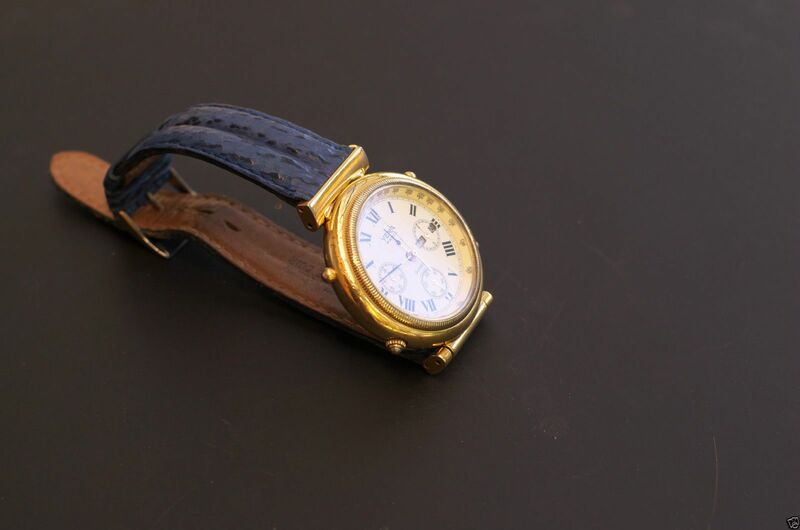 Eine praktische Day&Date-Anzeige befindet sich auf Höhe der 3-Uhr-Position. 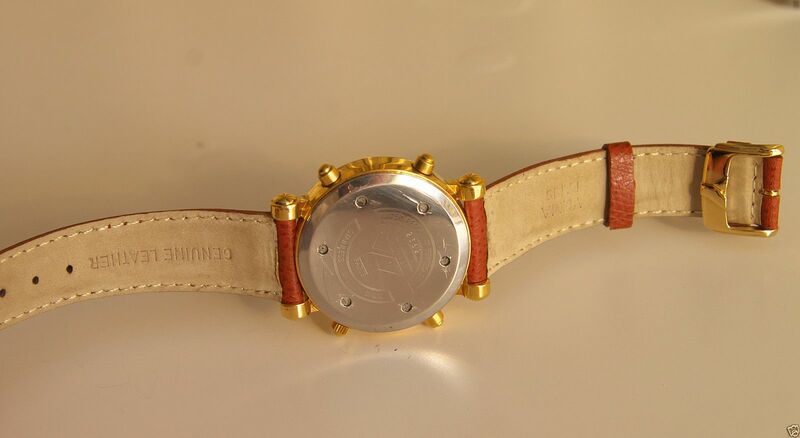 Neben der Stoppfunktion besitzt diese Uhr noch eine dezentrale Sekunde und eine Tachymeterskala. Das dazugehörige Edelstahlband eignet sich für einen Handgelenkumfang von ca. 18cm (mit Uhr gemessen; eine Kürzung des Bandes ist kein Problem). Das Modell ist außerdem spritzwassergeschützt (3ATM) und stoßgesichert. 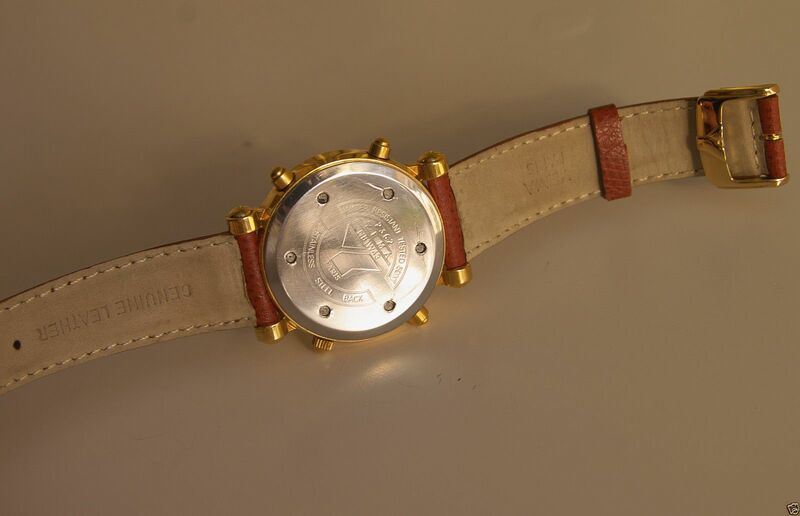 Die Uhr wurde gerne getragen, weist dafür aber nur wenige Gebrauchsspuren auf. Eine neue Batterie wurde vor ca. 6 Monaten vom Fachmann eingelegt. Das Quartz-Uhrwerk läuft einwandfrei und absolut ganggenau. 100% Originalware! Sie erhalten eine ordentliche Rechnung auf Ihren Namen per E-Mail. Der Versand erfolgt ohne den Uhrenständer! 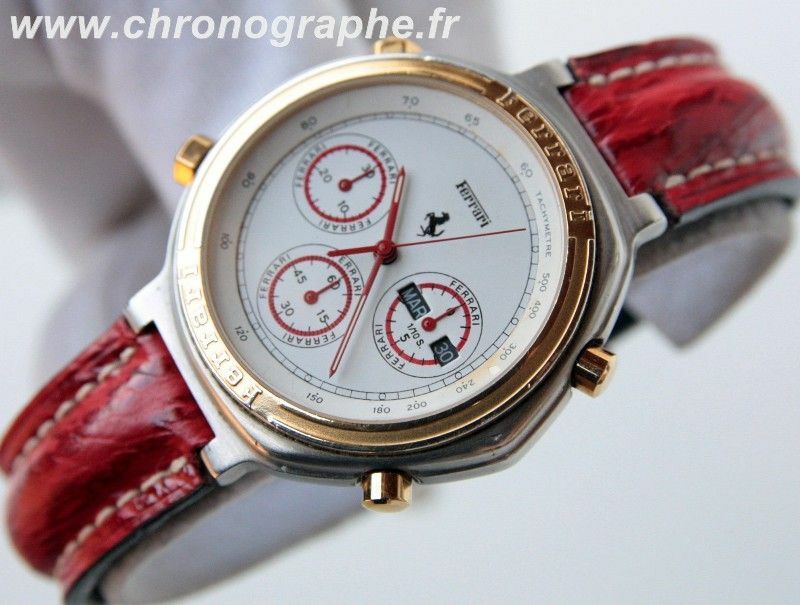 Eine Junghans Rarität im schönen Erhaltungszustand!!! 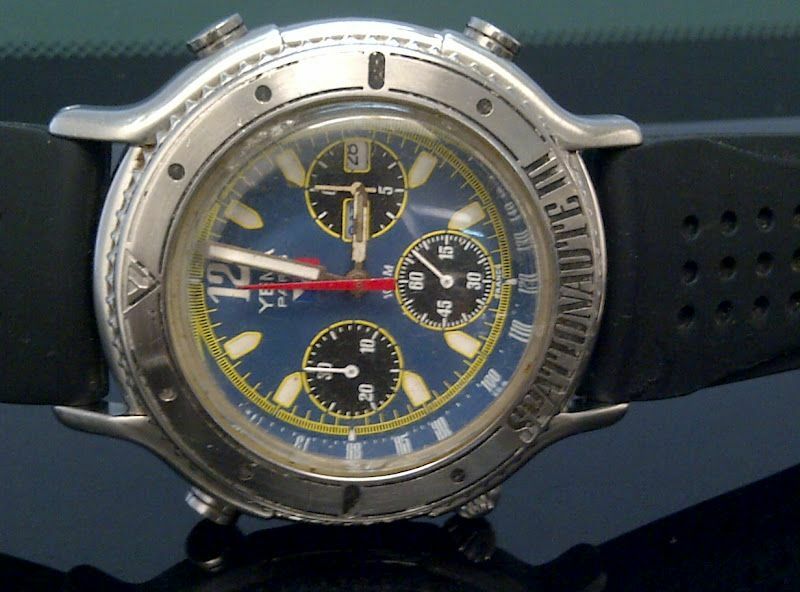 The vendor is our recently-identified German 7A38 re-seller 'fiedler-uhrenhandel' - a.k.a. 'The Fiddler'. 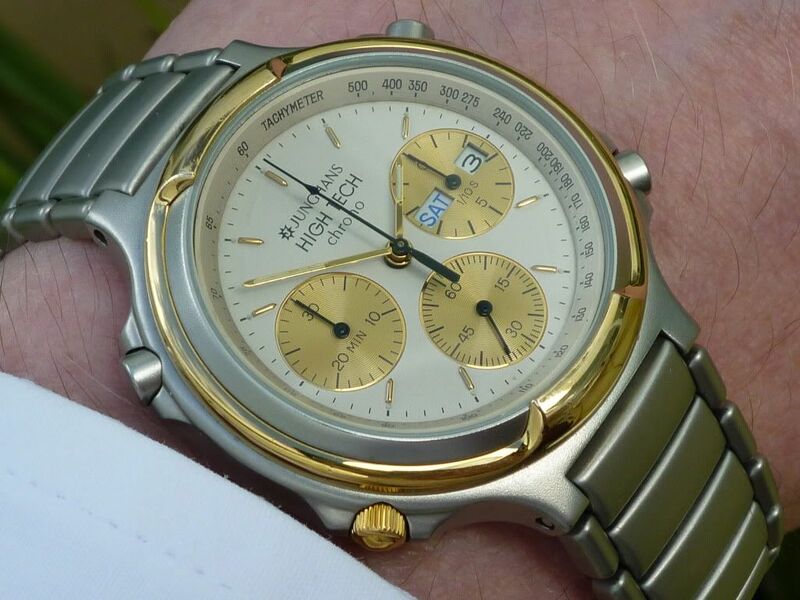 That's the 'pertinent' bit - the bracelet may look remarkably close, but it's not the correct original bracelet for a Junghans 24/4610. 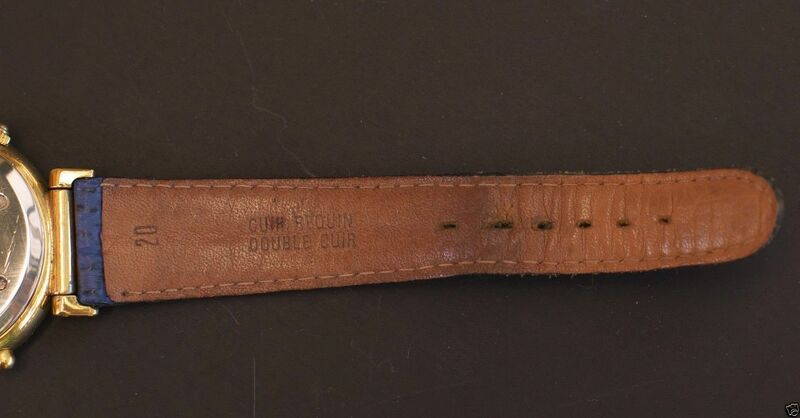 .... you can see that it was once a 16mm fitting bracelet which has been cut down (mit Dremel) to fit the watch's 14mm lug width. Ignore the 'Black and White' Day / Date windows in the above photo - that was an incorrect feature of that watch, before I rectified it. 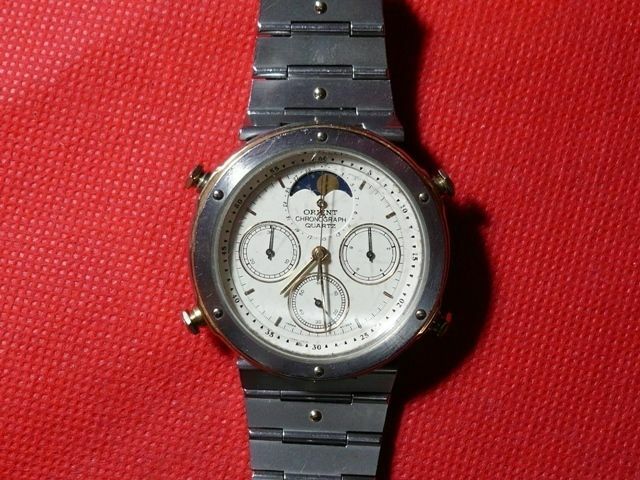 Basically it's an Orient J38001-70 moon-phase dial and presumably J3820 movement fitted in a Seiko 7A48-701A case and bracelet. The auction is due to end on Christmas Day, 2:30-ish in the afternoon. Be sure not to bid on it while under the influence. I'd noticed some incoming google searches on Yema on the forum's statistics package from Indonesia last week. 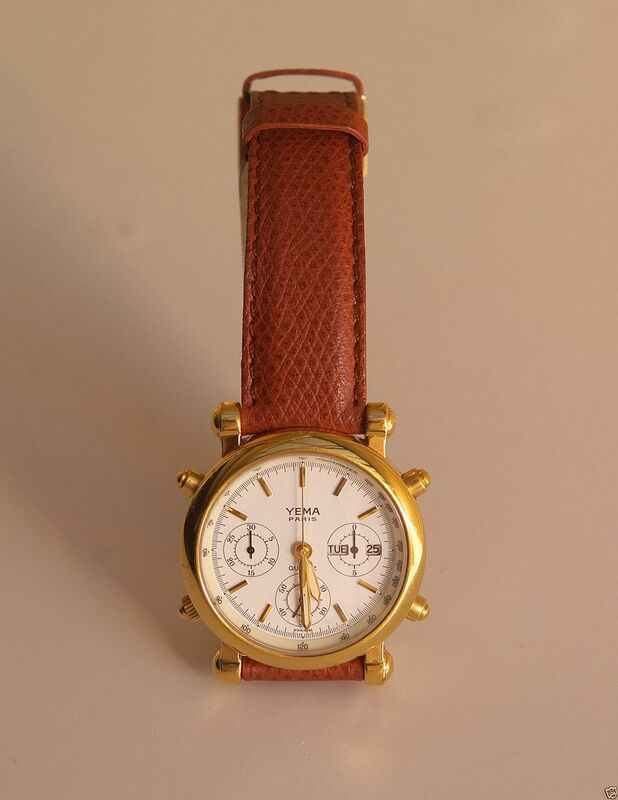 Not unusual, but one I specifically remember was on Yema model # N81W63. I think I know the reason why now. 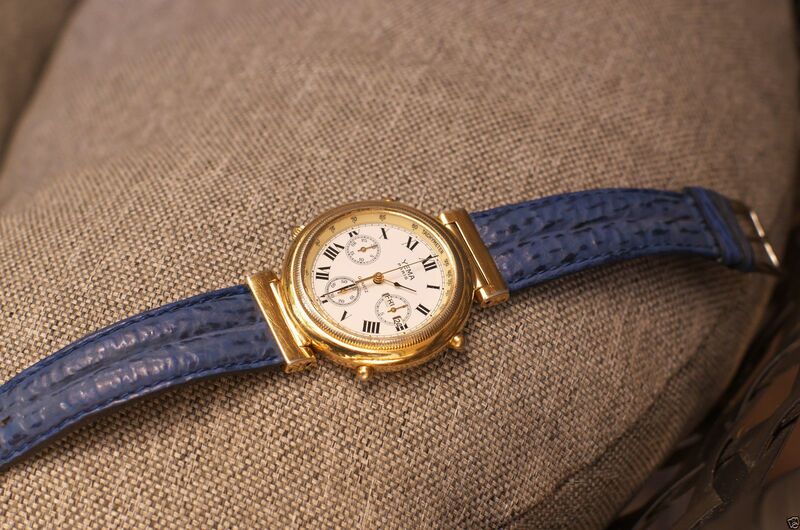 The white Roman numeral dial (hands minus lume) and Tachymeter ring are from a model # N81W53, fitted in a N81W63 case. 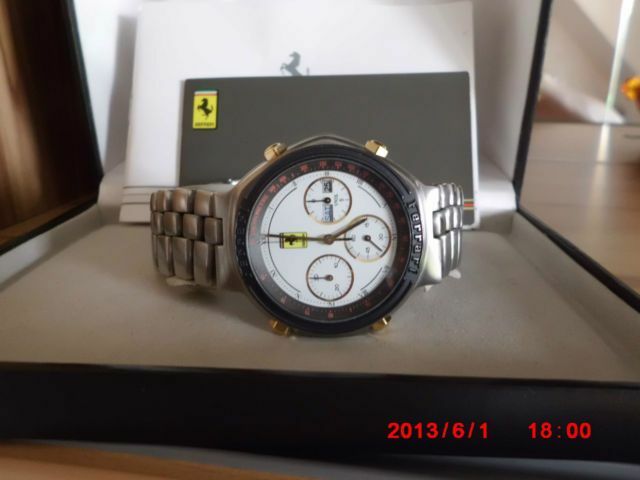 Indeed, I bought that very same watch from him, back in September 2010. 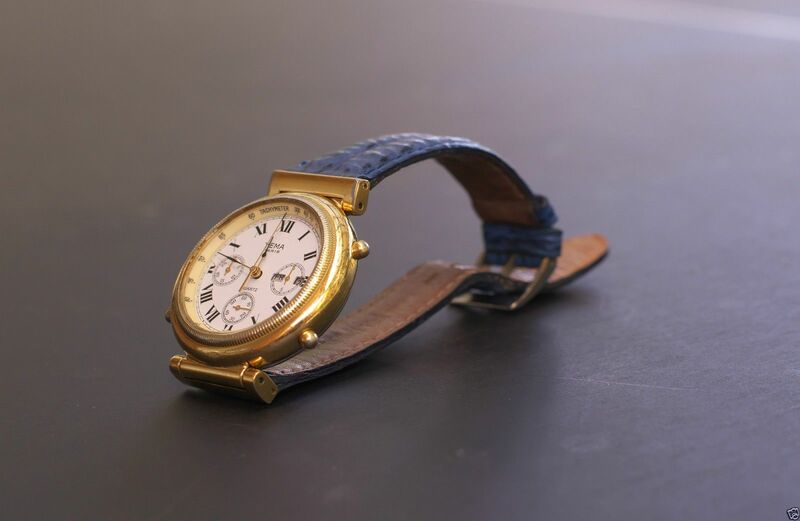 Using 'blogspots' to sell watches, as a cheaper alternative to eBay, is becoming increasingly popular in the Far East - particularly in Indonesia. 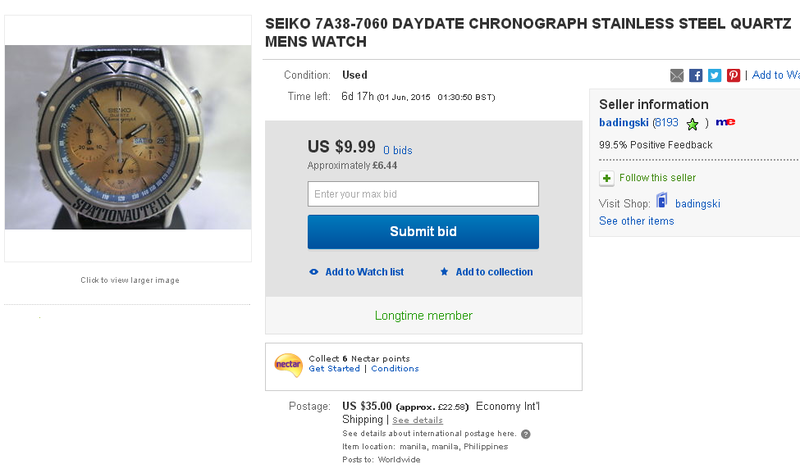 Like the Filipino eBay sellers, the Indonesian blog sellers turn up an astonishing variety of Seiko 7A38's and Yema N8's. 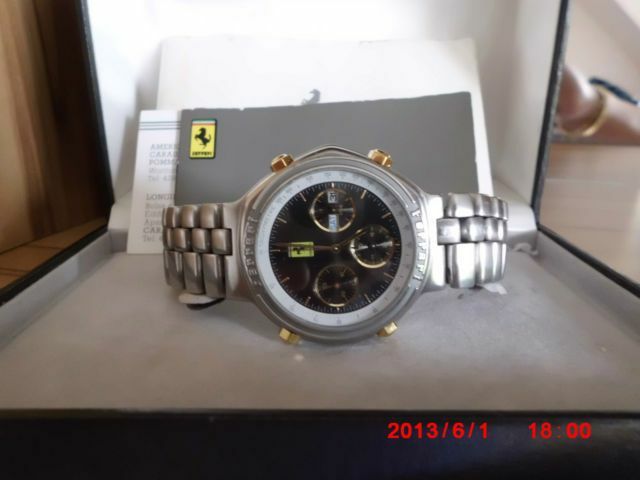 However the old adage 'Caveat Emptor' still very much holds true for some Indonesian sellers, who seem just as capable of cobbling together Frankens, like the aforementioned N81W53 / N81W63 combo' and 'bitza' botched-up watches, as their Filipino neighbours. 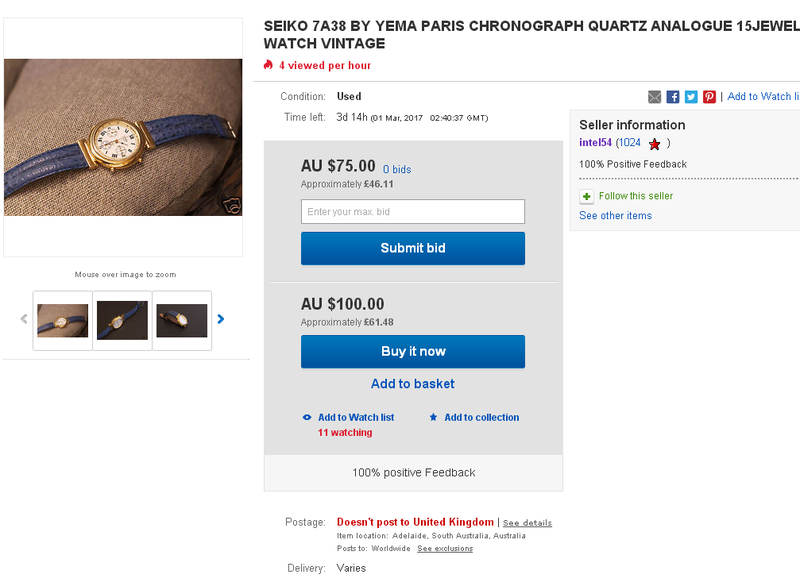 One of the problems of spotting such 'Wrong Un's on these Indonesian blogspots is that they frequently don't turn up in google search results until after they have already been sold - and I'm not about to start subscribing to umpteen Indonesian blogs on the off-chance that something of interest, Seiko 7A38 / Yema N8-wise, may turn up. I've got enough on my plate already, thank you very much ! This may be well after the fact, but I thought as I'd started writing up this post as a salutory warning, I'd cite it as another awful example. 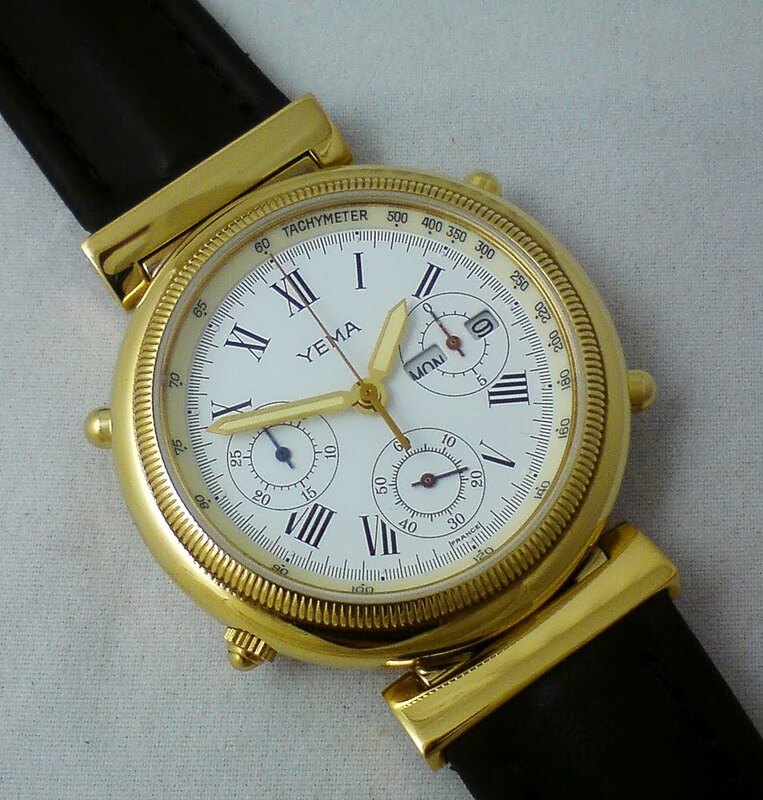 Truly a horrible example of a botched-up Yema Spationaute III, fitted with replacement acrylic crystal and non-original sweep hand. 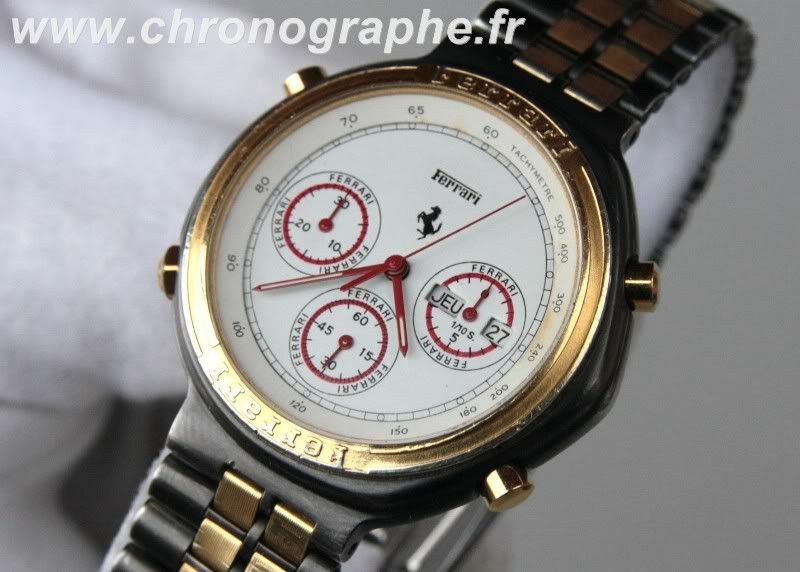 He appears to do a fair turnover in used Cartier Ferrari Formula chrono's. Some are as per original spec. .... others not quite so. Except it's not all quite as 'original' as he'd have you believe. Note how the crown in the third photo appears to be hacked. Or is it a case that because it's the wrong type, it can't be pushed home ? 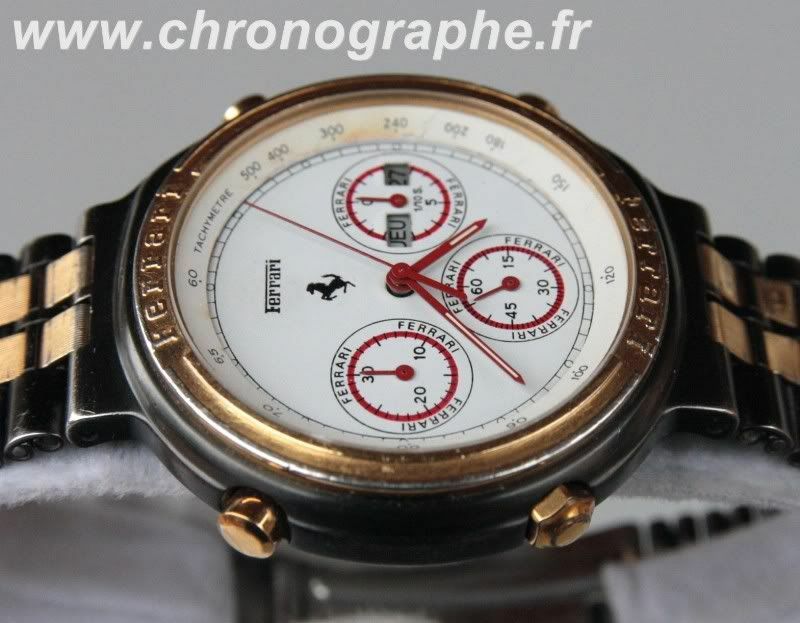 However, Philippe's 'pièce de résistance' is the Day / Date wheels. 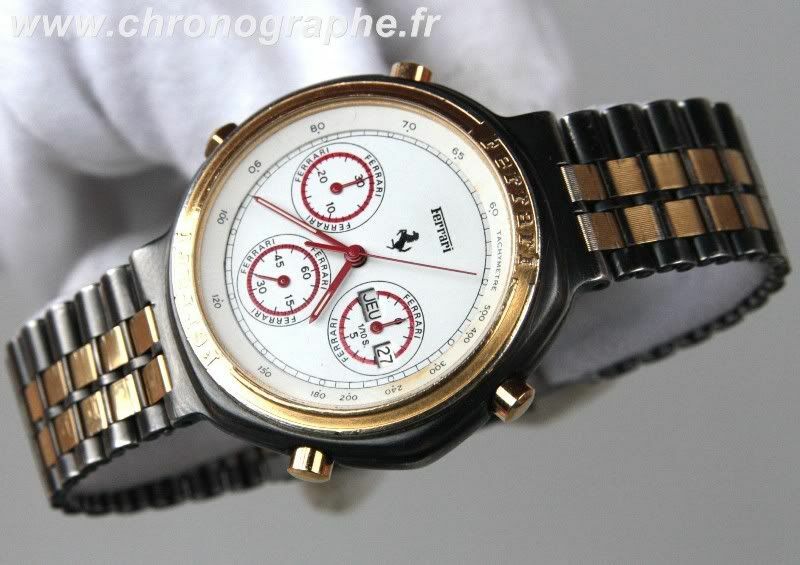 I've seen a good few Cartier Ferrari Formula chrono's over the last few years. 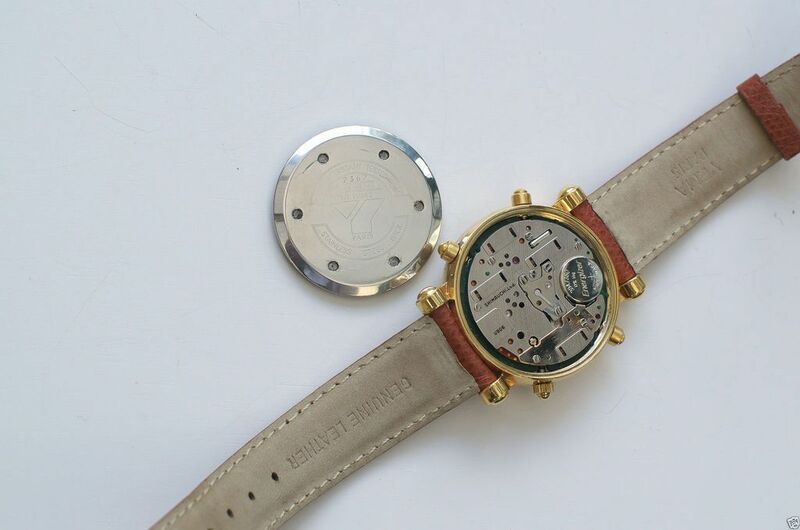 Dials with various shades of Black, Grey, Gold, Red of course, White - in many subtly different designs, including several of this 'concentric circle sub-dial' type. NEVER before have I seen one (even the Black dials) fitted with White on Black Day / Date wheels. 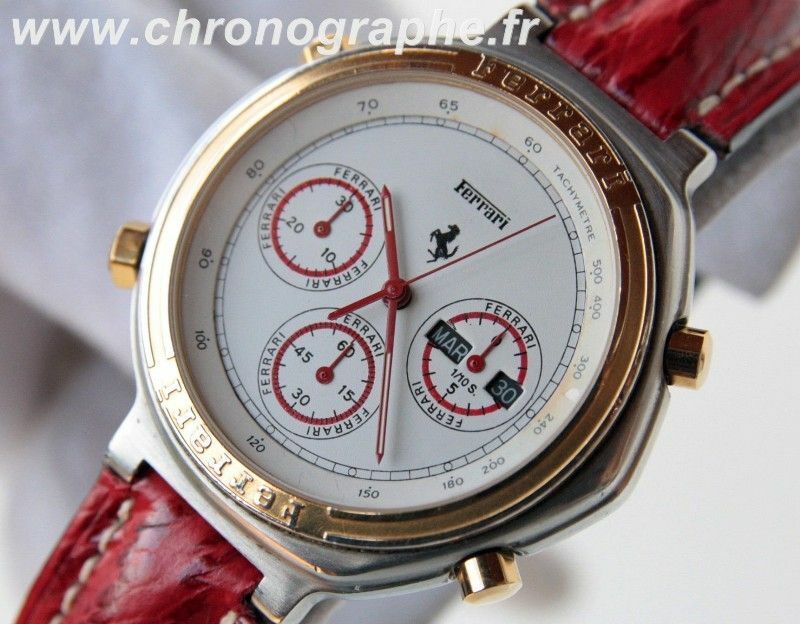 I suspect this Cartier Ferrari needed a movement transplant, the original having succumbed to water ingress. 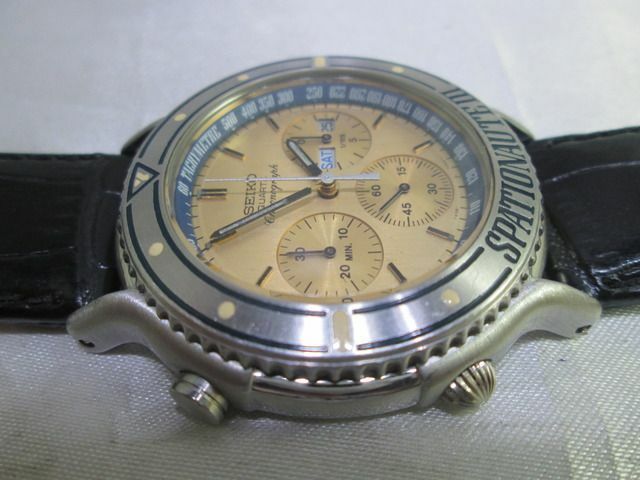 Note the rust staining on the Tachymeter ring, particularly around 300 to 240. 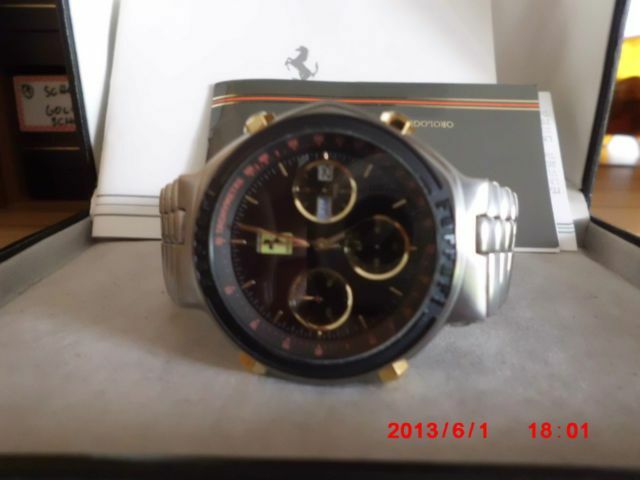 Presumably it received one from a humble (black day / date) Seiko 7A38 donor. 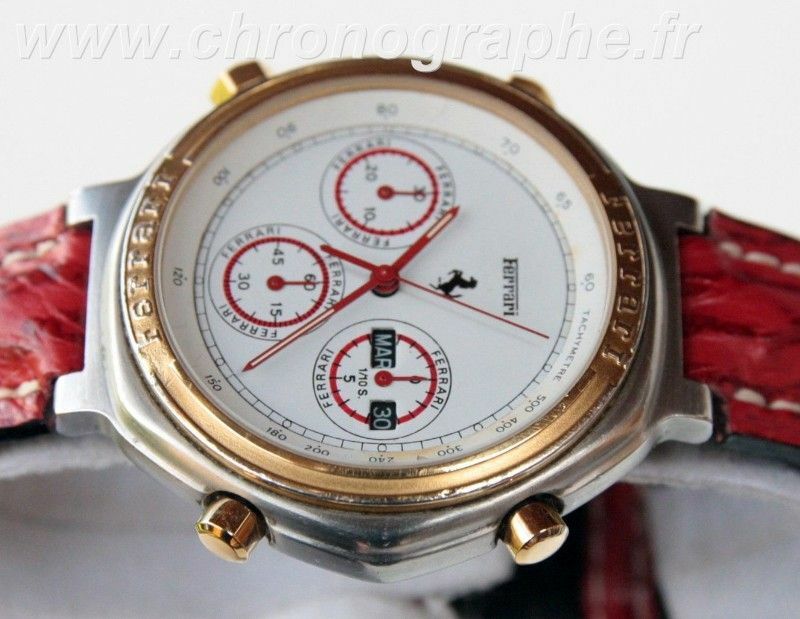 As a 'quick' sanity check, I've just scrolled through the 1350+ images I have on file for Cartier Ferrari Formula chrono's. Yup 1360. Not one has white lettering on black background day / date wheels. All are black on white - regardless of the main / sub-dial colour. 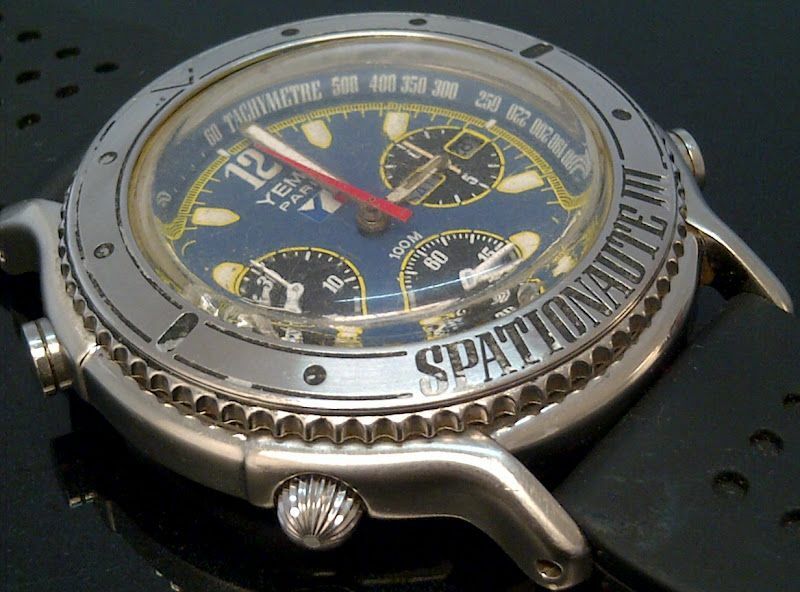 Notice how this one coincidentally also has rust staining on the Tachymeter ring, again particularly between the 300 and 240 marks. 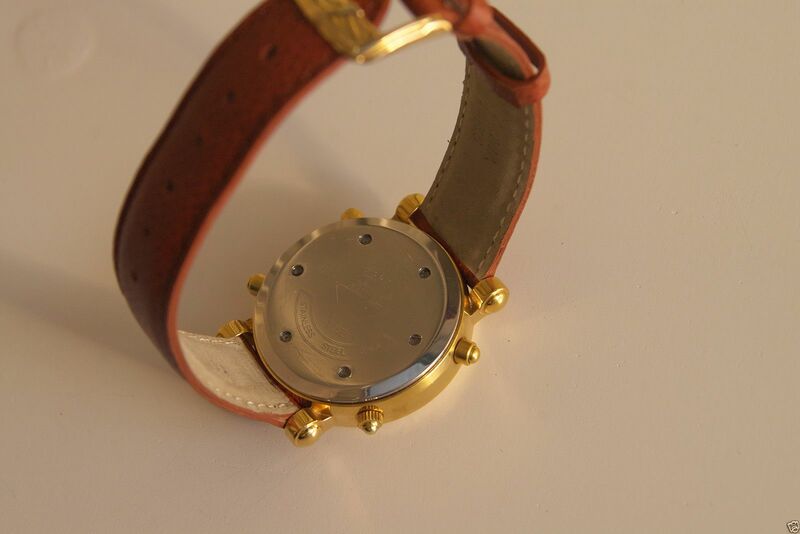 Looking closely at the rust marks on the Tachy ring, plus an identical spot on the 1/10s subdial, adjacent to 0.85 of a second mark .... 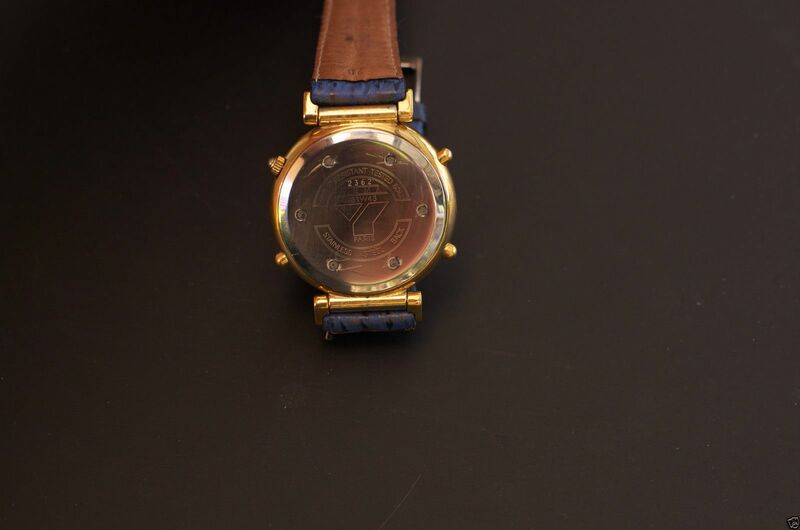 I'd even go as far as to say that these watches have more than a little in common. Which all just goes to show that even if buying from a 'reputable' online dealer (as opposed to eBay) you need your wits about you. 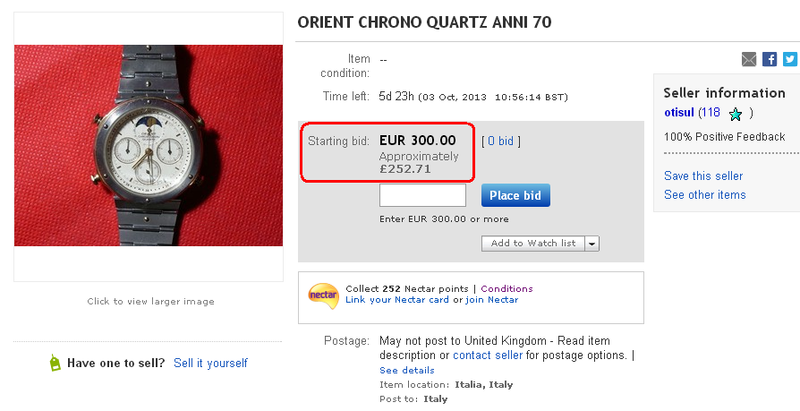 Not only for his constant inconsistent spurious listing activities, such as starting with low opening bid prices, with no reserve set, then ending listings early (allegedly because the item is no longer available - but they nearly always re-appear, usually after a month or so), alternating that with 1000+ Euro Buy-it-Now prices, but also because it's becoming patently obvious that he likes to mess about with his watches. 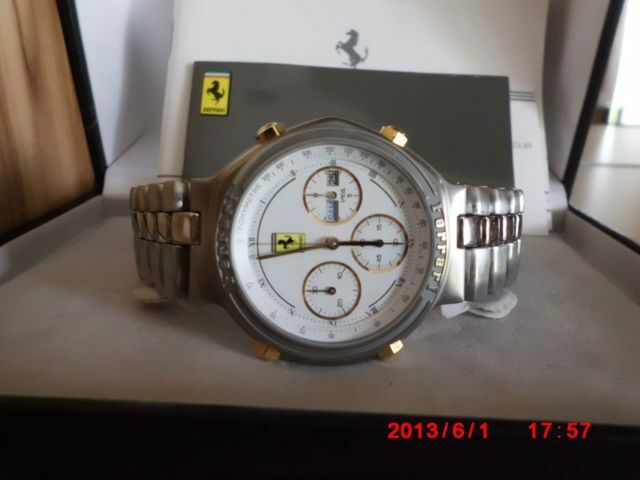 I am of course referring (once again) to the Austrian seller SriLanka20082012 who usually lists them on eBay Germany. 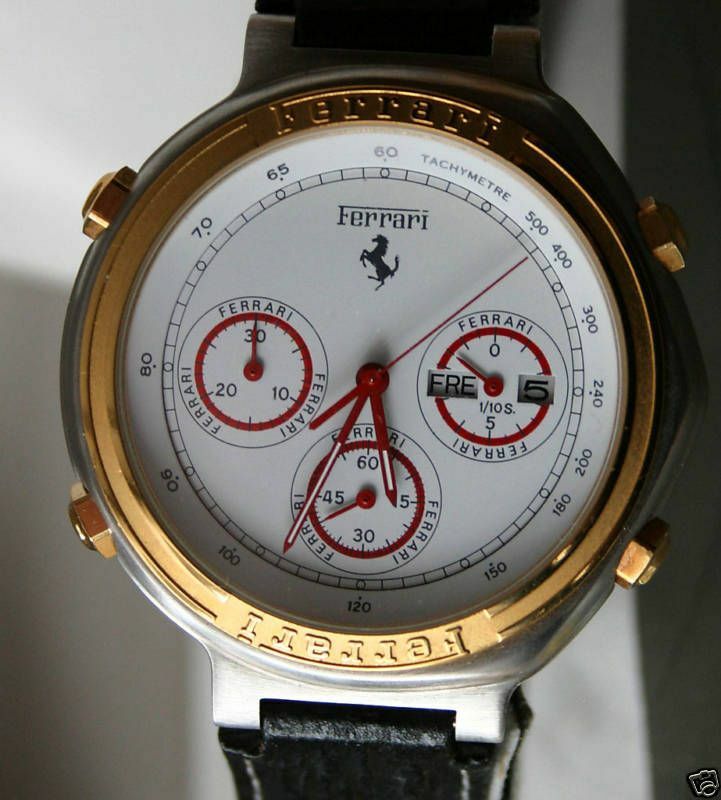 I'm currently in the process of trying to work out exactly how many different genuine permutations of Ferrari Formula were produced. photos that I've right clicked and saved, from eBay listings and elsewhere - 'sorting out the wheat fron the chaff', so to speak. 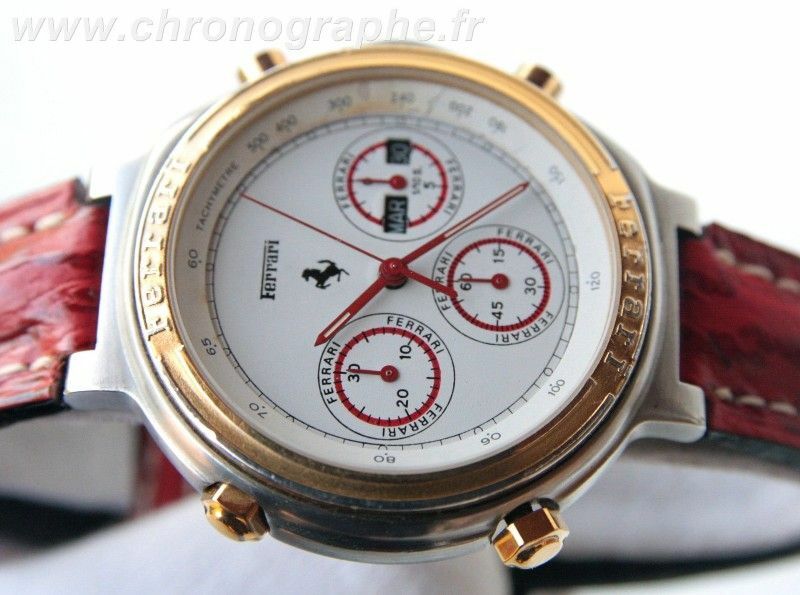 Over the last three and a half years, I've seen a disconcerting number of Ferrari Formula chrono's that obviously weren't what I'd class as 'right' (i.e. 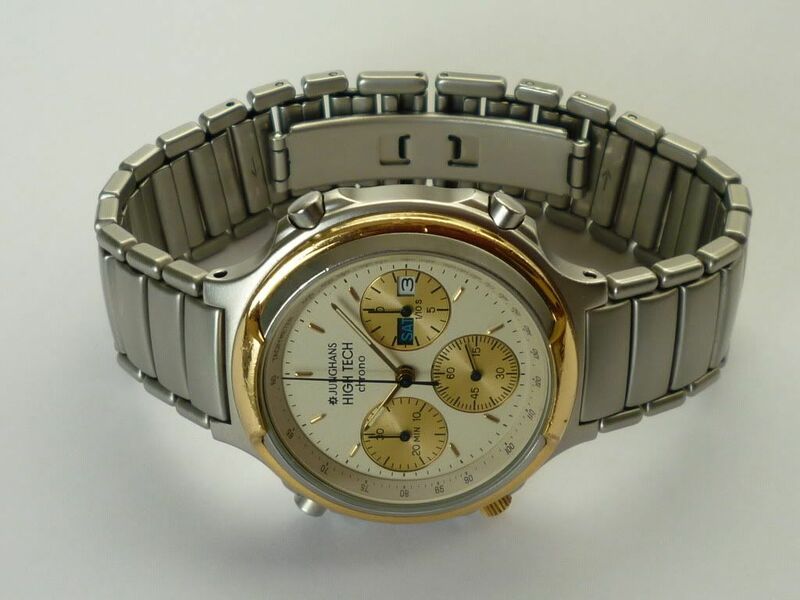 correct and original) - the obvious mis-matches; 'early style' dials in 'later style' case and bracelets; wrong colour Tachymeter rings, etc. 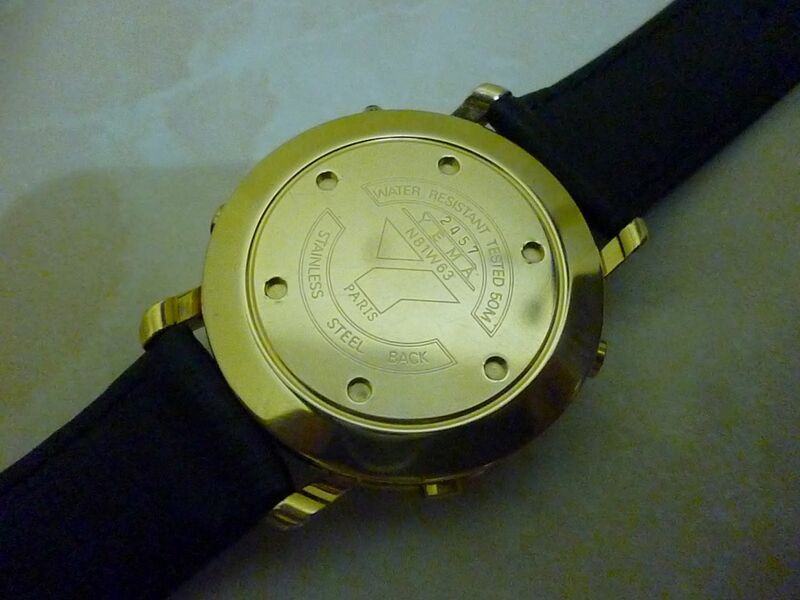 Most of them seem to emanate from eBay Germany, and particularly from this seller. 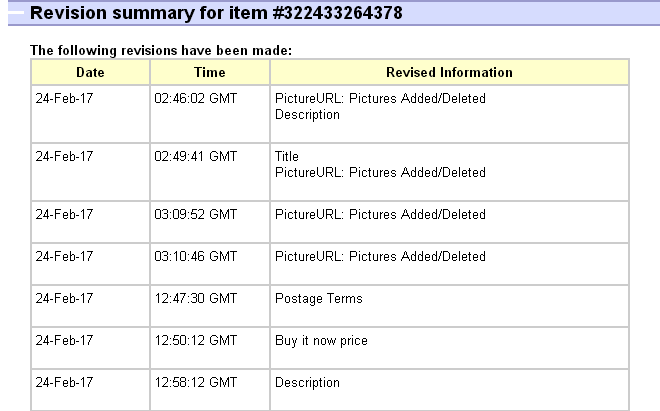 Yesterday he produced another 7 new eBay listings, which included two absolute classic examples of his 'Mash-Ups'. It's pretty obvious, from their mis-matched harshly contrasting dial versus Tachymeter colours that he's swapped these two over. Here's an illustration from a 1991 Ferrari Formula brochure which shows one of them in exactly the correct original configuration. It makes you wonder exactly what this idiot is trying to achieve - other than making my little 'permutations' exercise more tedious. PS - I guarantee you every one of those 7 listings will be ended early (as usual). I'll happily state now, that IMHO, the other 5 of those 7 listings were for perfectly correct-looking examples in very nice condition. But one of them wasn't quite so new: http://www.ebay.co.uk/itm/140989656548. 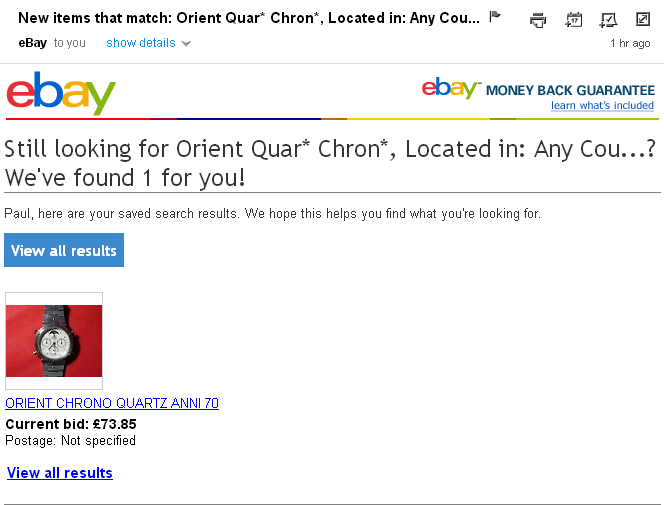 http://www.ebay.co.uk/itm/140975073072 - less than two weeks ago, in this case ! I'd only bid on them to prove my case. My sympathies to genuine bidders who thought they might be in with a chance. Fat chance ! 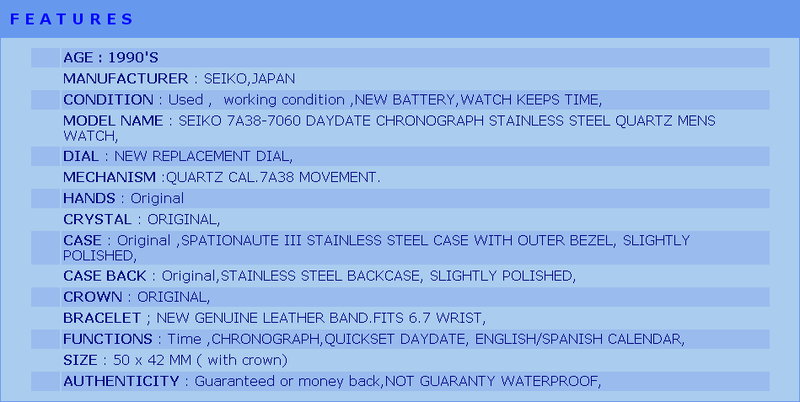 That Seiko 7A48 / Orient J38 Franken has been re-listed numerous times since. Last time I added it to my eBay watching page, in August, the price had come down to 75 Euros - still no takers, thankfully. 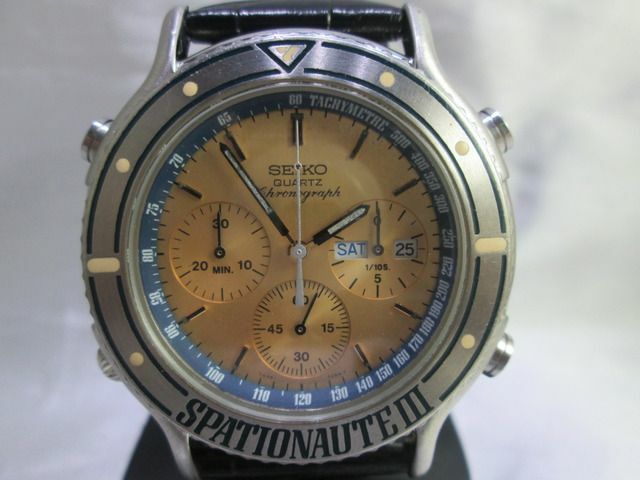 That same Seiko 7A48 / Orient J48 Franken has been re-listed umpteen times over the last few months @ 300 Euros. I say oddly, because when I clicked on the link, a couple of hours later, the listing had already ended ! Thankfully, once again, no-one had fallen for this mis-represented, cobbled together piece of junk. Yup this one is still doing the rounds. The would-be seller's last 3 re-listings (I've long since lost count of how many there've been in total) were at an opening bid price of only 40 Euros - still nobody bit. 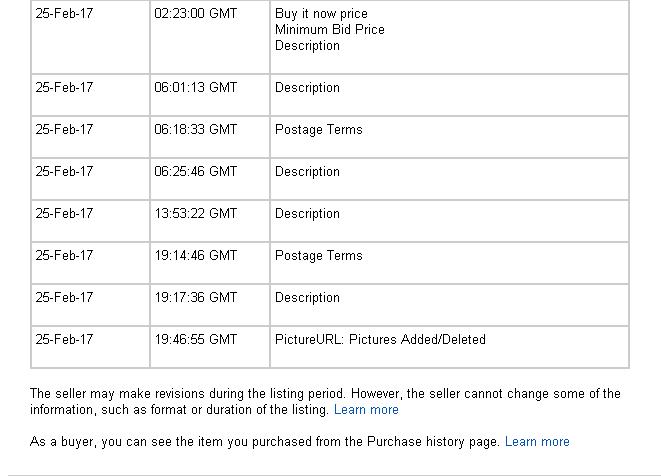 The latest re-listing overnight is at 30 Euros opening bid price. I guess it won't hurt to add a copy of it to this thread, where it fits just as well. I believe the current in vogue expression is: Made me want to throw up in my mouth (with or without 'a little bit'). Well, when I clapped eyes on Filipino arch watch botcher Badingski's latest aberration abortion, when I ran a worldwide search on eBay, first thing this morning, it made me want to full on chuck up ! 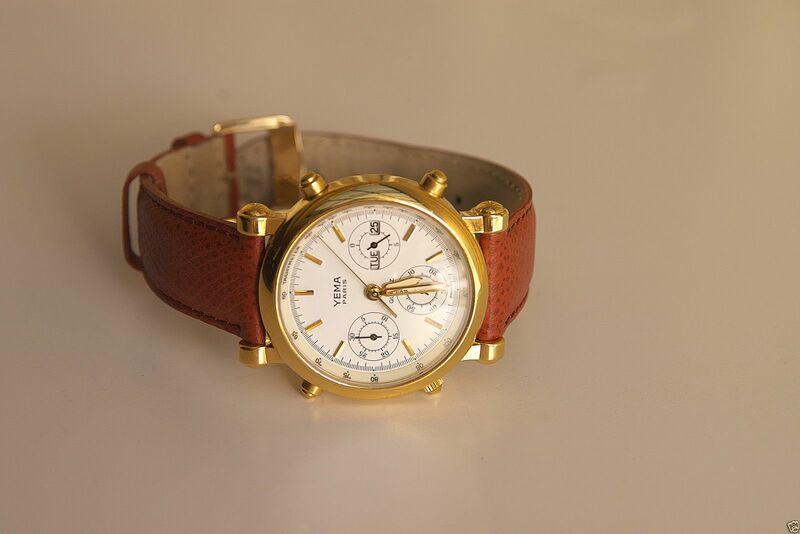 This thing is of course a Franken hotch-potch of a 43mm Yema Spationaute III (model # N80P76) - case, bezel, crown, Tachymeter ring and (silver painted) sweep second hand, fitted with the dial and most of the hands and slightly smaller diameter case-back from a gold-tone 7A38-7060. 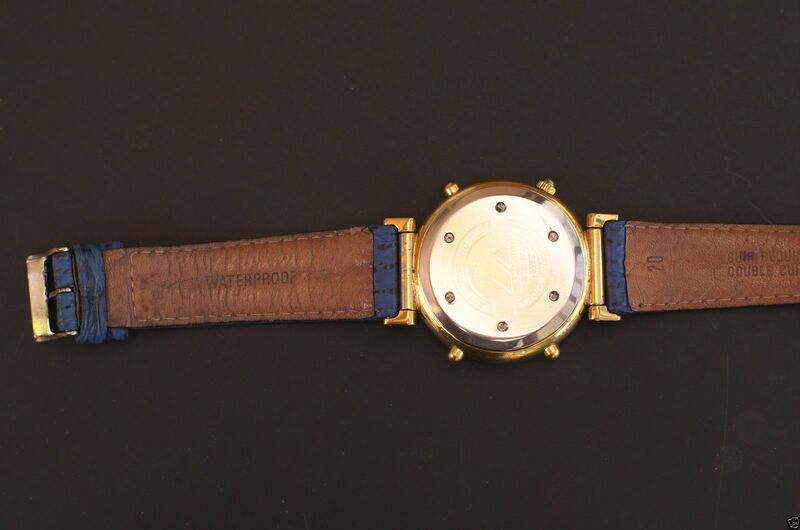 The movement anti-magnetic back-plate is the Shimauchi V906 printed item (mostly rubbed out) from the Yema Spationaute III, but the battery positive plate is stamped Seiko 7A38A. It doesn't bear thinking about what lies underneath. 'Famous last words' from my first post in this thread - I can always move it. It's been well over a year since I last added anything to this thread - indeed I'd apparently almost forgotten it existed. 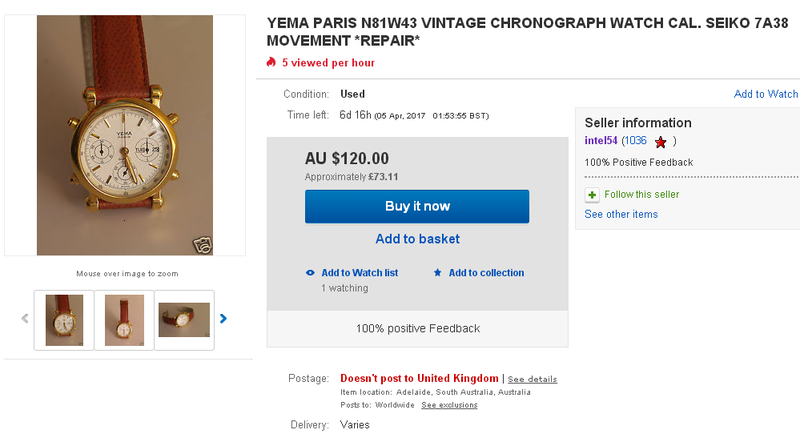 Last week, Friday 24th February 2017 to be precise, an Australian eBay seller intel54 listed a very subtle Yema N8 Franken. In hindsight, it was anything but subtle - I simply failed to recognise it for what it was and proceeded to write it up as if it were any 'normal' Yema N8 in the Yema N7s and N8s spotted on eBay, LeBonCoin and Yahoo.jp thread (content now moved here). Ironically, I started off my post there with: Difficult to miss this one, with the first two words of the title being 'Seiko 7A38'. More so that I followed up with: You'll note there's no mention of the Yema N8 model number in either his title or description. And especially seeing as there's a similar precedent (of sorts) higher up this page .... See my post dated April 11th, 2013. Difficult to miss this one, with the first two words of the title being 'Seiko 7A38'. 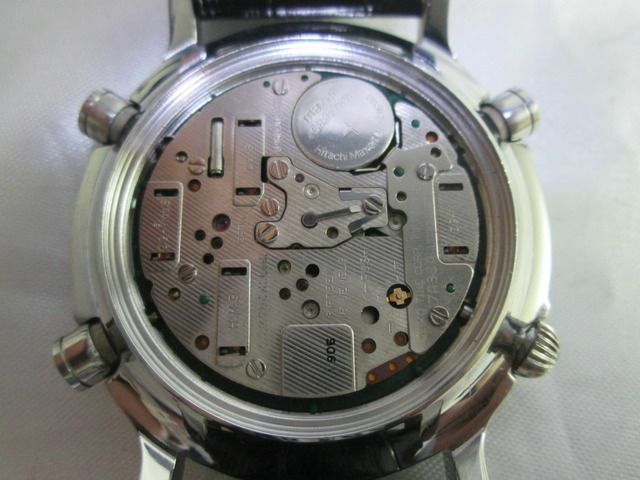 Ironic though, because a broken plastic day / date changeover wheel, like this watch is apparently suffering from is the Achilles Heel of the Seiko 7A38A movement - just as it is for its less frequently credited Shimauchi Ltd. V906 branded sibling. But I digress. This dressy Yema was listed in the early hours of this morning by an Australian eBay seller, who's clearly got something against Poms and Krauts, because he's excluded both UK and Germany from his ship to locations. Do I care ? You'll note there's no mention of the Yema N8 model number in either his title or description. It's a N81W53. 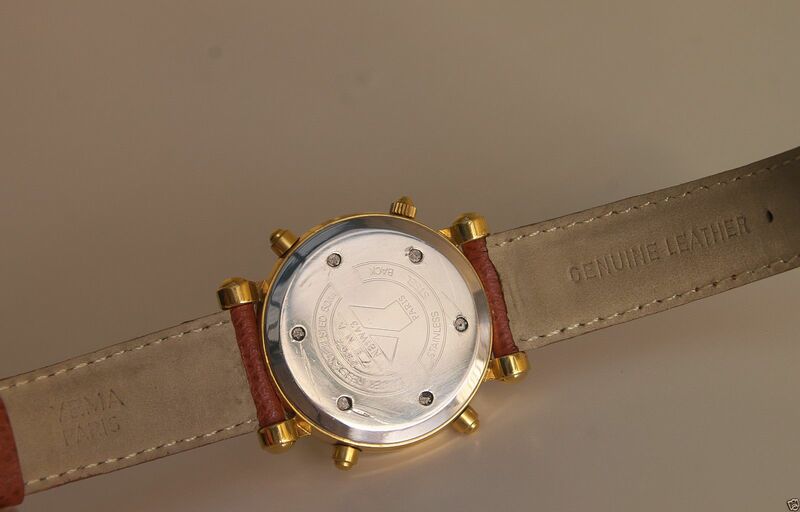 Strange, because if you zoom in on the photos, you'll see this watch is fitted with the wrong case-back off its sister model, the N81W43 - one that's been typically graunched by 'some other ham-fisted' oaf. 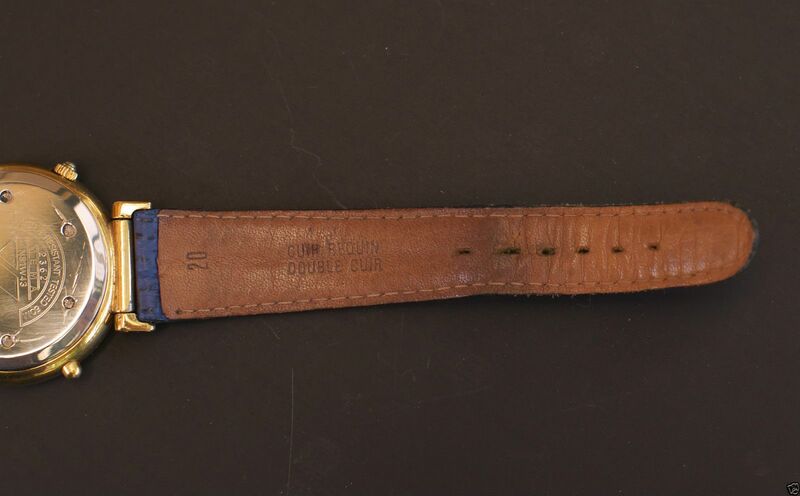 The 'Genuine Leather Band, Possibly Original' fitted isn't original, although it's period correct - 'double jonc' blue shark straps were very much in vogue in the early 90's. 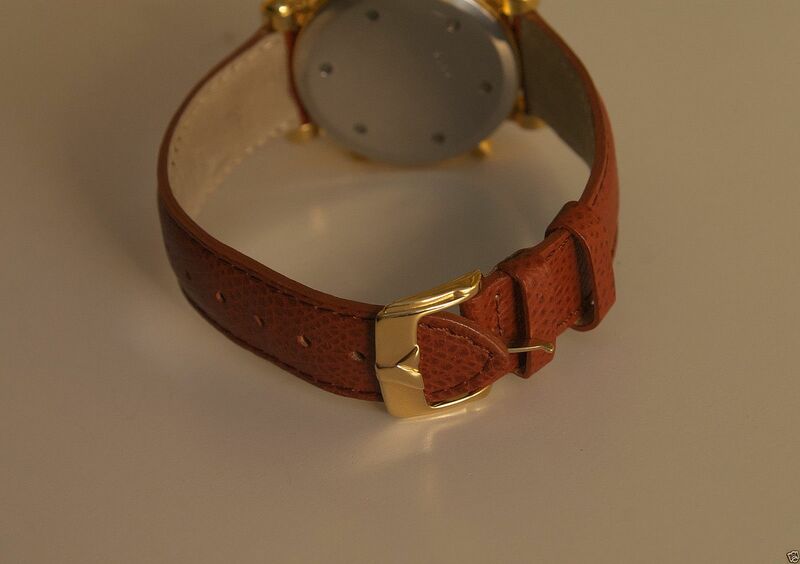 For one thing, it's a 20mm strap that's been squeezed to fit the 19mm lug width. Looking at the construction, style of buckle and French embossing, I'd wager it was a ZRC. That's where I fell down on the job. Badly. No excuses. 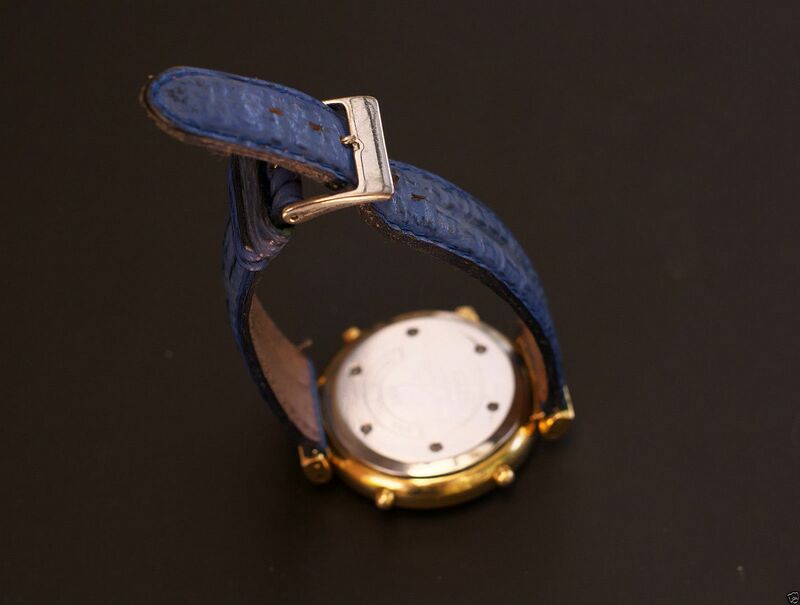 I knew instinctively there was something wrong with this watch - and almost immediately homed in on the nastily graunched N81W43 case-back fitted to a N81W53 case. 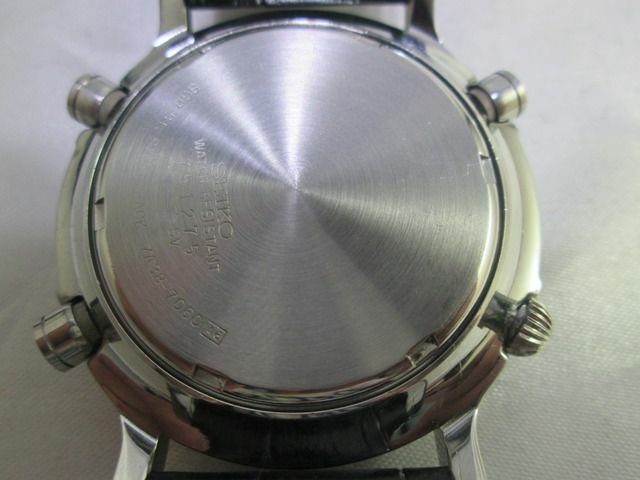 But somehow (don't ask me how), I failed to spot that it was also fitted with the dial / movement from the N81W43. 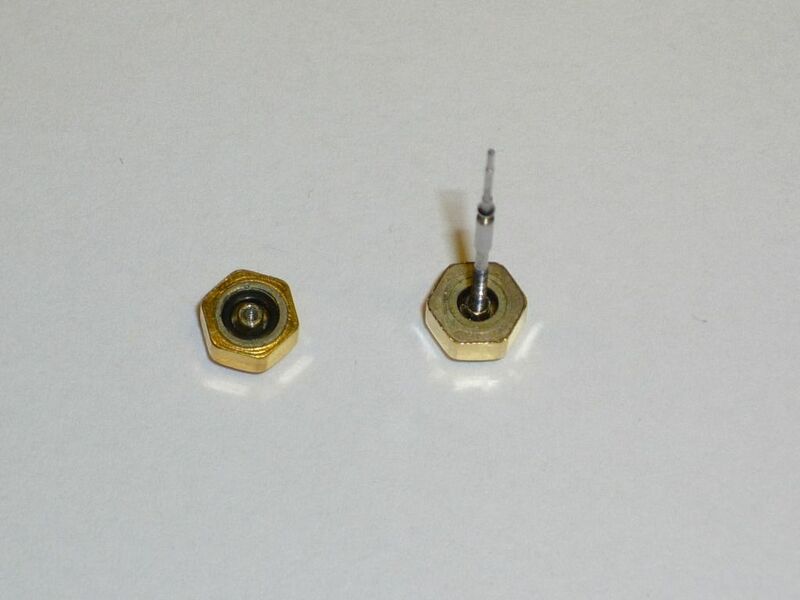 Both these Yema N8 models came fitted with two different dials / hand sets within their respective case numbers. The N81W43 could have either the slightly odd big 12 dial or the condensed bold Roman numeral dial with rather small sub-dials. 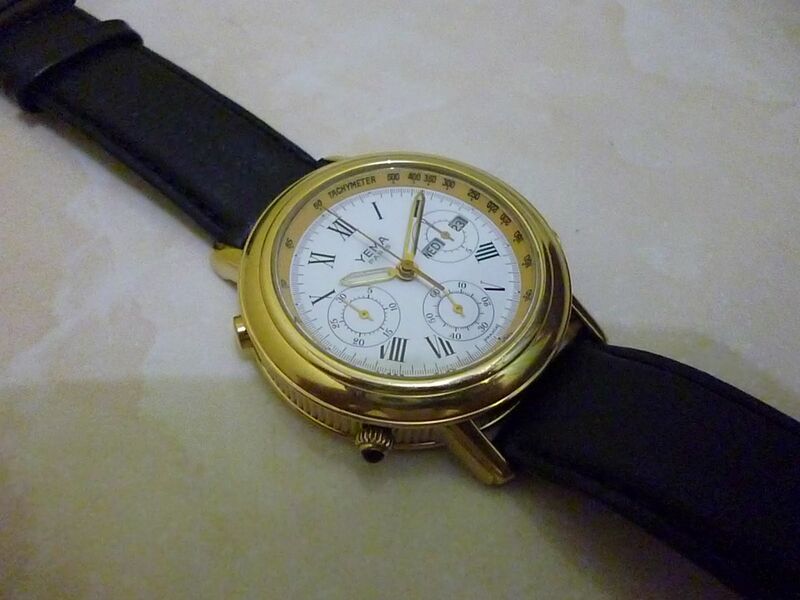 The N81W53 could have either a rather attractive gold baton dial (of more anon) or a Roman numeral dial with larger fonts and sub-dials (as shown in the photo higher up this page in my post dated April 11, 2013). 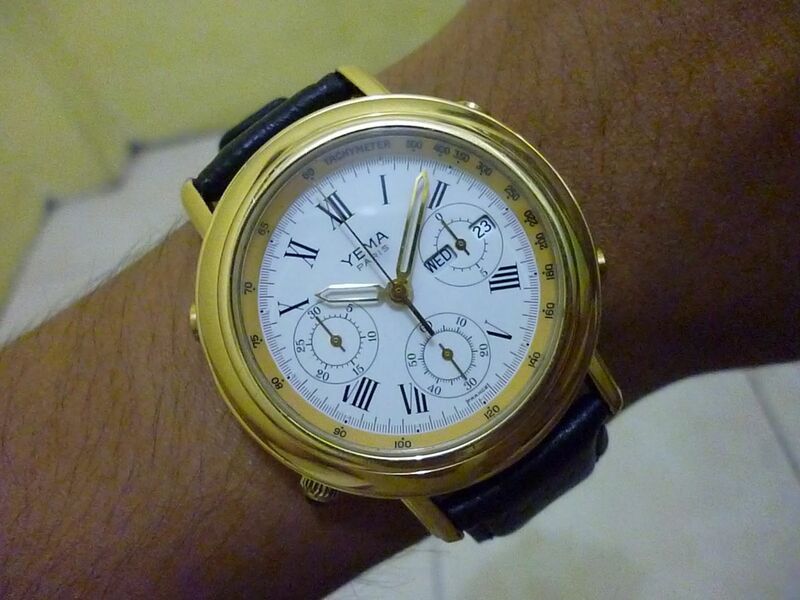 Perhaps it was the (wrong) Roman numeral dial that initially threw me. More likely, if I'm honest, I was more concerned with taking the p!ss out of this incompetent eBay seller than correctly gathering (all) the facts. I should explain that Australian eBay seller intel54 (Mick to his friends, among whom I most definitely don't figure) and I have history. I'd previously noticed he often makes multiple revisions to his eBay listings - usually correcting stupid mistakes - 'unforced errors' but sometimes for no apparent reason. It seemed that this listing was going to follow the usual pattern. Here follows transcripts of relevant content, moved from the Yema N8 thread, originally posted on 25th February. 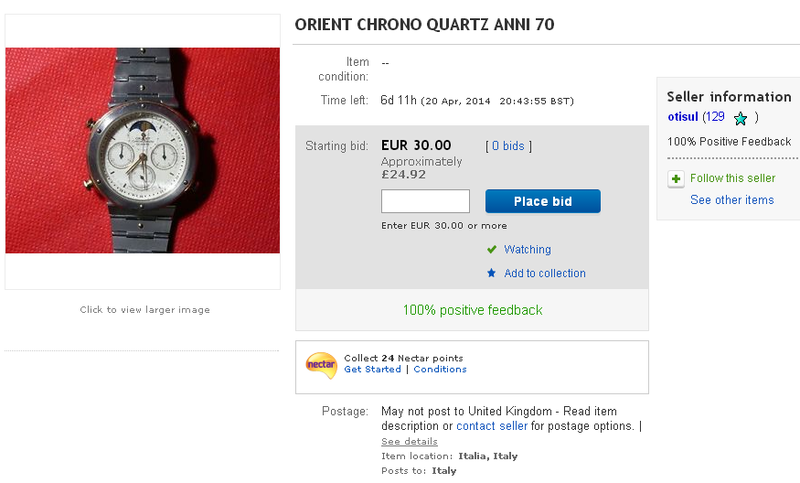 Reminded me of his previous eBay listing, that I had the pleasure to comment on, for an Orient J38 last November. 18 revisions. 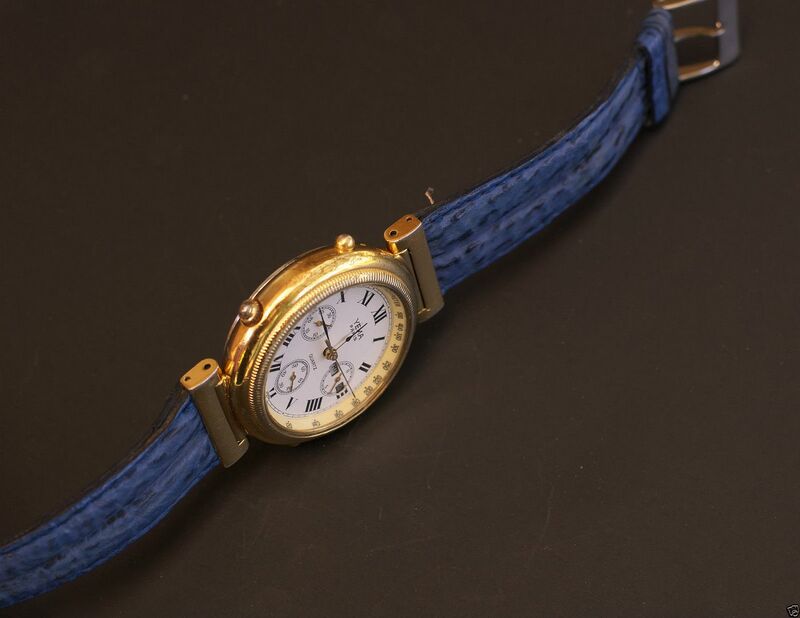 Which of course is the Orient J38 that I'd eluded to at the bottom of my previous post, the long saga of which is documented here. ..... most notably reducing the pricing slightly, but still hasn't bothered to mention the Yema case-back model number discrepancy. It really did beg the question why he'd reduced his pricing so quickly - less than 24 hours after first listing the watch. Clearly because he knew it was a 'wrong un' and he wanted to get shot of it before too many people sussed that out. 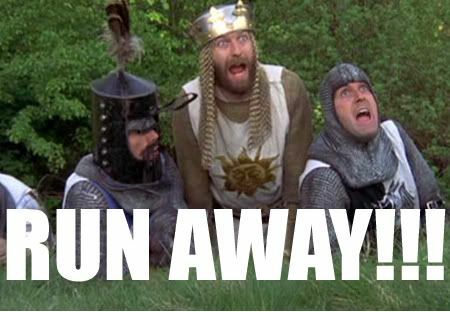 Yesterday, after reducing his opening bid and Buy-it-Now price, the Australian eBay seller intel54 continued to make numerous revisions to his listing - totalling 15 in all, most of which can be summed up as childish, irrelevant, trivial and truly pathetic. However, the last revision, where he added / deleted (and in between edited two existing) photos was actually quite significant. 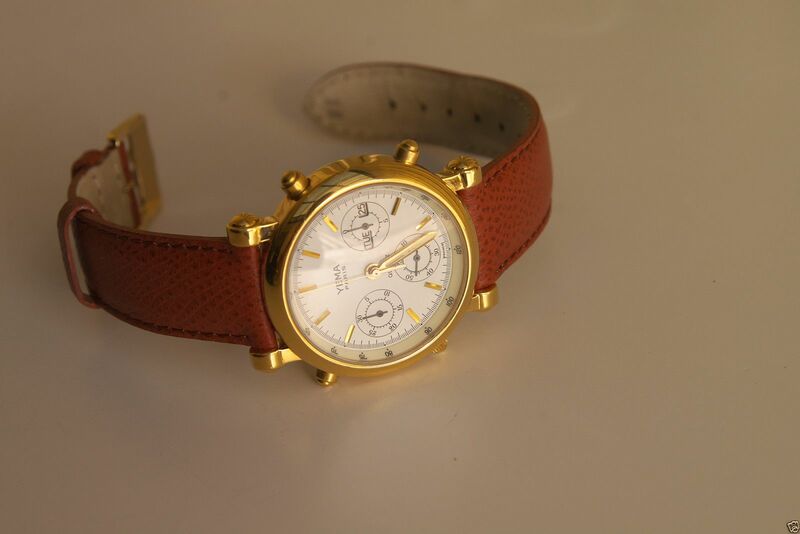 He then deleted one photo and replaced it with another showing the watch now fitted with the correct (ungraunched) case-back. 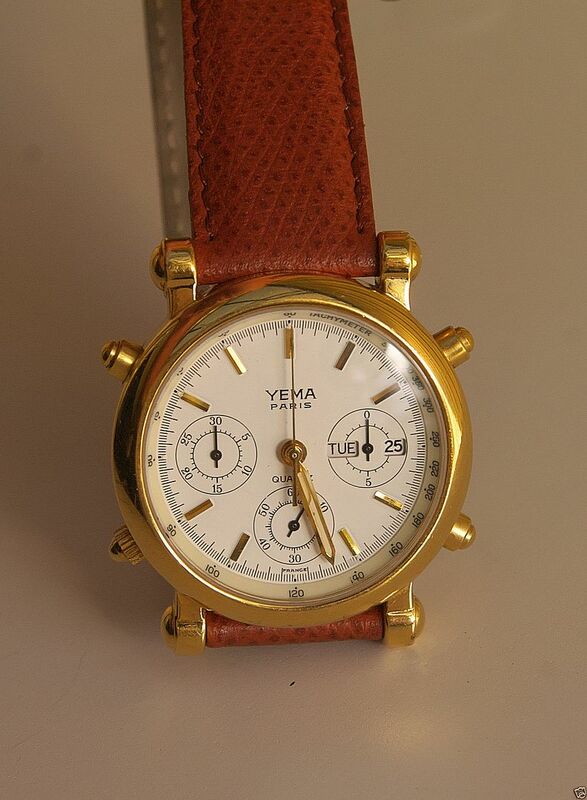 The Yema N81W53 now fitted with the correct case-back sold in the early hours of this morning for the $100Au Buy-it-Now price. Edit: The 'wrong case-back' issue was of course just the tip of the iceberg - a red herring that initially threw me a curve ball. 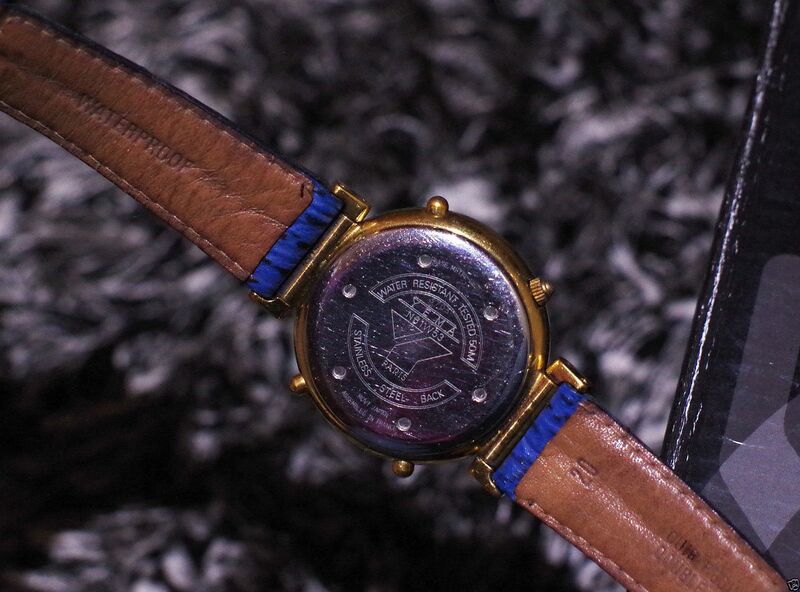 This watch was, in hindsight, a complete and utter Franken - the dial and hands of a N81W43 in a N81W53 watch case. I guess I knew this was coming, sooner or later. 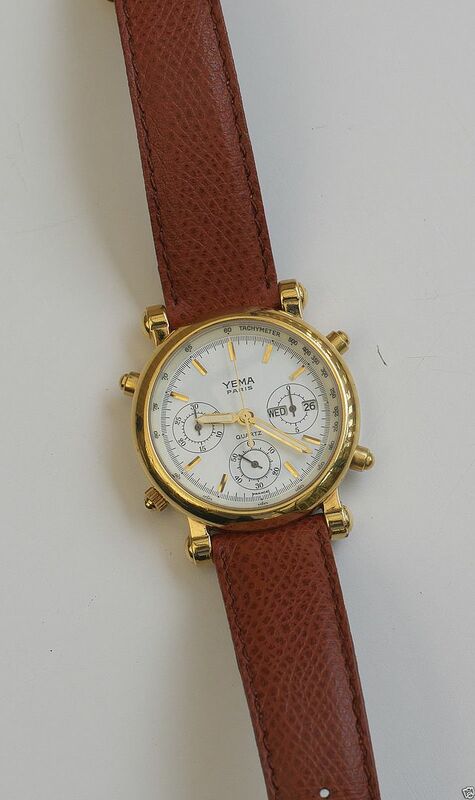 Overnight, devious Australian eBay seller intel54 listed this deceptively attractive Yema N81W43. Unlike his previous listing of a month ago, this one includes the Yema model number in the listing title. 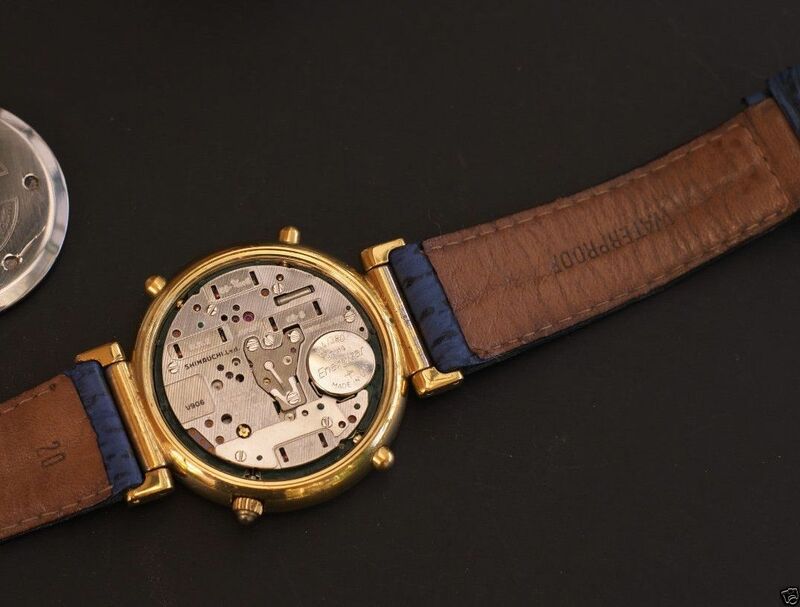 This is, of course, another subtle Franken, effectively made up from the parts he had left over after his last swapping exercise, including the badly graunched N81W43 case-back s/n 2362 that was originally incorrectly fitted to the previous N81W53 Franken. 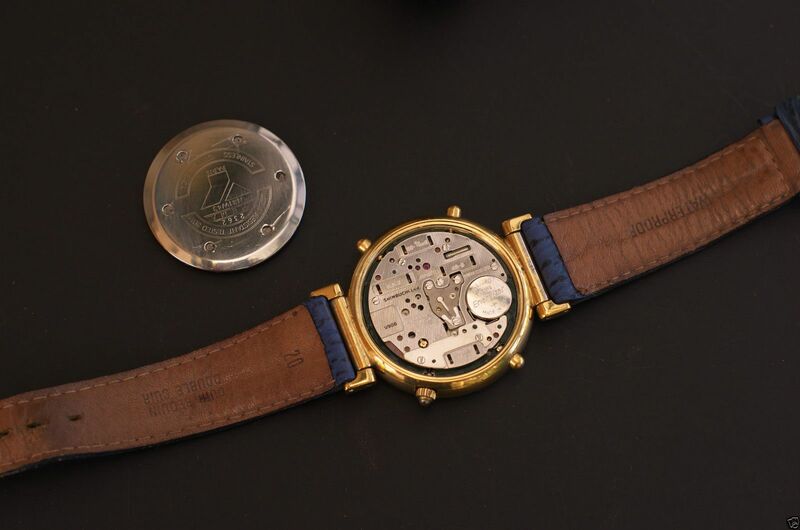 The gold baton dial (and presumably movement) presumably once belonged to the previous N81W53 Franken. Rather than copy and paste the seller's description text, I've taken a screen print of it - as it currently stands, prior to any editing. 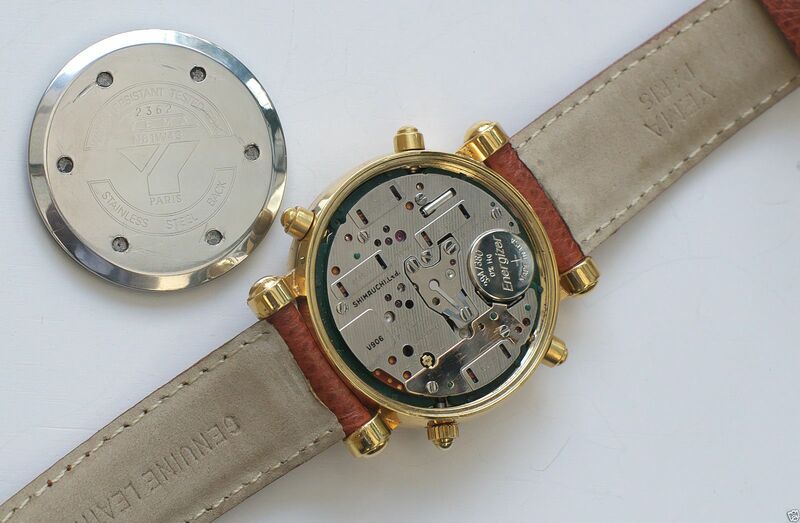 The fact that he's had a month to sort out the sticking switch lever actuator (presumably the reason he swapped the two Yema N8's dial / movements in the first place) and still hasn't managed to fix what is usually just a 10 minute job, points to the complete incompetence of this wilful and dishonest watch-botcher. Duly awaiting the first edit to the description.